Whether you're hoping to enjoy an Italian-style Christmas or just want to escape to the City of Water this time of year, there's plenty to do and see in Venice, Italy, in December. From Hanukkah celebrations and observance of The Immaculate Conception to wandering through the Campo Santo Stefano Christmas Market or ringing in the New Year at the Festa di San Silvestro, you'll have ample opportunities to enjoy the mild winter weather and holiday cheer. Although winters are typically cold and moist throughout much of the moderate continental climate of Italy, temperatures rarely drop below freezing in December. Instead, you can expect an average high of 45 degrees Fahrenheit and an average low of 34 degrees throughout most of the month. However, Venice is also subject to sudden cold wind currents blowing from the plains of Eastern Europe known as bora, and you might see frost accumulate overnight as a result though won't likely see much snowfall since the bora is typically a dry wind. Rainfall or precipitation in the form of snow is expected for six days out of the month, on average, with a monthly accumulation of 2.4 inches. Additionally, the city experiences a phenomenon known as acqua alta (high water) during bad weather conditions paired with strong winds and a rising tide that sees several of the streets and walkways flooded. With relatively cool days and chillier evenings, you'll need to pack a variety of clothing to accommodate the changing weather in Venice throughout the month of December. You'll need to bring a warm winter coat—ideally, one that has room underneath for a thick sweater—as well as a lighter (yet still warm) coat for daytime travel. You'll also need to pack warm gloves, a knitted hat, and a scarf, especially if you plan to go out on the water in a gondola ride. Although rain and snowfall are infrequent in December, you may want to pack waterproof shoes in case of a sudden bout of acqua alta, but you won't likely need to bring an umbrella as the month is mostly dry. Although Italy is a largely Catholic and Christian nation, you will be able to find some Hannukkah celebrations in most large cities, and you'll also find plenty of celebrations of religious holidays of all sorts as well as national holidays like Saint Stephen's Day in December. Hanukkah: Hanukkah is a Jewish holiday that takes place over eight nights that usually takes place sometime between early to mid-December (and sometimes November). In Venice, Hanukkah is traditionally celebrated in the Venetian Ghetto, which was the first segregated Jewish community in the world, dating back to 1516. In the Ghetto, within the Cannaregio Sestiere, you will see the lighting of the large Menorah each night, and get the chance to participate in traditional and fun Hanukkah festivities with locals. Sampling the wide variety of kosher foods is a must, and there is no shortage of delicious treats available for purchase. The Immaculate Conception (Immacolata Concezione): On this day, December 8, the Catholic faithful celebrate the conception of Jesus Christ by the Virgin Mary (Madonna). As it is a national holiday, you can expect many businesses to be closed in observance, as well as several masses (services) held throughout the city at many different times of the day. Campo Santo Stefano Christmas Market: Taking place from mid-December until mid-January, the festive Christmas market in Campo Santo Stefano is filled with stalls selling high-quality and frequently handcrafted Venetian items including nativity scenes, children's toys, and delicious seasonal treats. Plenty of food, drinks, and live music are also a large part of the festivities that will put you in a jolly holiday mood. Christmas Day (Giorno di Natale): You can expect everything to be closed on Christmas Day (December 25) as Venetians celebrate one of the most important religious holidays of the year. Of course, there are many ways to celebrate Christmas in Venice, from attending midnight mass at Saint Mark's Basilica to visiting Christmas crèches (nativity scenes) around the city. Saint Stephen's Day (Il Giorno di Santo Stefano): This public holiday takes place the day after Christmas (December 26) and is typically an extension of Christmas day. Families venture out to view nativity scenes in churches as well as visit the Christmas markets and just enjoy quality time together. The feast day of Santo Stefano is also held on this day and especially celebrated at churches that venerate Saint Stephen. New Year's Eve (Festa di San Silvestro): Just as it is all over the world, New Year's Eve (December 31), which coincides with the Feast of Saint Sylvester (San Silvestro), is celebrated with much fanfare in Venice. 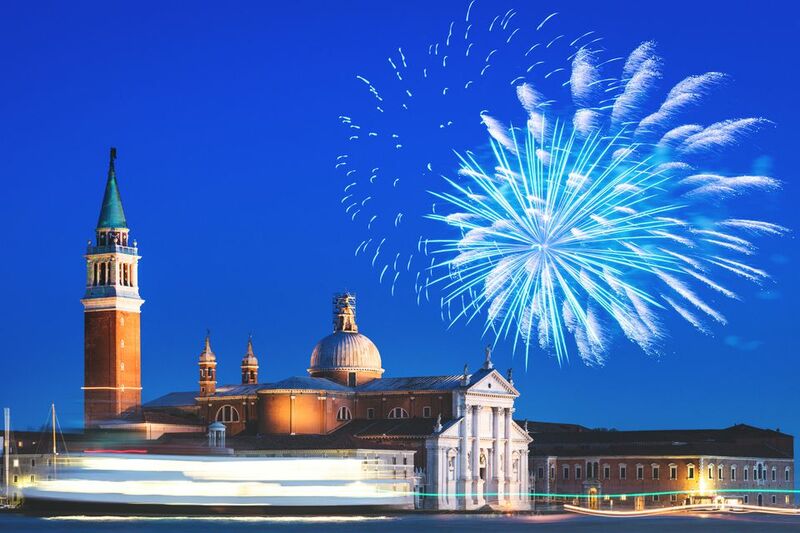 A huge celebration is held in Saint Mark's Square culminating in a fireworks show and countdown to midnight.